Sandwiched right between France and the Netherlands, Belgium is often overlooked. 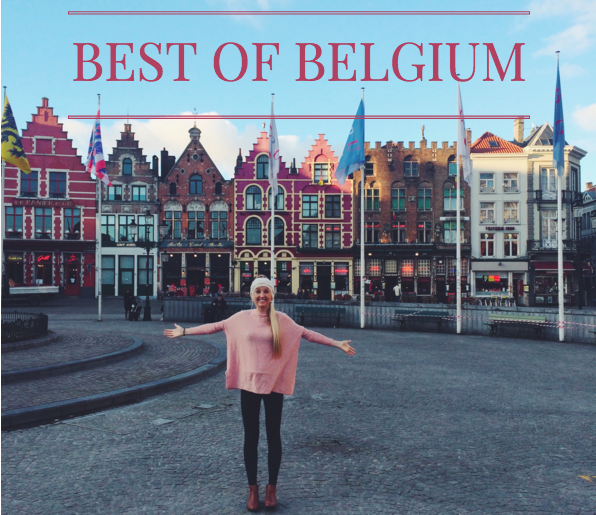 Brussels, Bruges, Ghent, and Antwerp and today I have a bit of a guide to the best of each! Convenient location: It’s tough to choose which to visit among the many countries of Europe, but Belgium makes it easy being situated right between two of the most popular destinations: Paris and Amsterdam! Train travel through Brussels is so easy and it is very connected. From Brussels, there are high speed trains to all of the smaller towns making it very easy to get around. Architecture: Belgium has some of the best, most intricate, & most unique architecture in all of Europe. Be sure to visit the Grote Market (main squares) in each city or town. WAFFLES: Truly- the liège waffles here are how waffles should be…and a reason to visit in themselves! Of course, don’t forget about frites and chocolates as well! Big city + small towns: In this one country you can visit the headquarters of the European Union as well as some of Europe’s most charming small towns. There’s something for everyone. Diversity: Along with that diversity of place, Belgium also offers diversity in many other ways. Half of the country speaks Flemish (in the north), and the other half speaks French (South). Brussels itself is even more diverse with many expats from all over the world due to being the European Union capital where the Parliament sits. It is international and cosmopolitan while still maintaining its charm. Slow pace: Some may consider Belgium “boring” compared to the nearby cities of Amsterdam and Paris, but I think it is even more enjoyable to visit due to the calmer, more traditional atmosphere. It feels less crowded and rushed, like taking a step back in time. Belgium provides a break between the faster destinations like Paris and Amsterdam. People: The Belgian people are unique and proud of their country. They are friendly, funny, (just ask them about Belgian comics!) and very different from their neighbors. Hopefully now you are convinced to add Belgium to your next European travels..
have their own accent here, and the entire city is more interesting than is given credit. I recommend at least stopping through this city before heading onto the smaller towns! 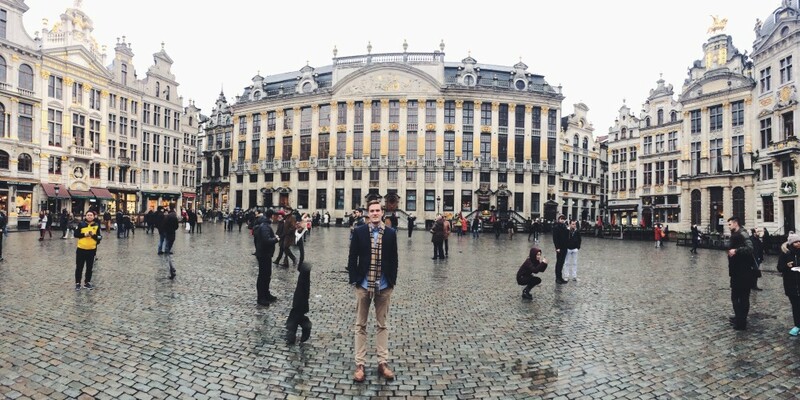 Grand-Place: The main attraction in Brussels, it’s hard to miss this gorgeous square. I remember the first time we stumbled into it on a sunny day when I was in college, and it took our breath away. It is beautiful and a must-visit. The city hall has been here since 1402, and it is the sight of many major historical events. I love how huge and open it is, I love the gold buildings reflecting off each other, and I love the cobblestone streets filling it. If you are lucky and visit during one of the years it’s happening, there is an incredible flower carpet set up in the square…you can see a photo here! It’s every other year in August so a bit tricky to plan around, but so amazing even to imagine. If you miss this, there is still a flower market in the square during part of the year with little outdoor concerts at night. Charm galore! Cathedrale St-Michel et Ste-Gudule: A short walk from the square you can find the most beautiful cathedral in Brussels. It is set on a hill and very pretty. Manneken-Pis: Definitely one of the stranger attractions in Brussels (or any city), this funny statue of a chubby whizzing little boy is the most photographed statue in the city. The statue is tiny and a bit bizarre, but it’s part of local tradition and folklore and it will make you laugh. It’s just a street from the Grand-Place. Best frites: Maison Antoine. It’s touristy, but a great place to try the famous Belgian frites + sauce. (Don’t skip the sauce! It’s the main event here). There are also little stands everywhere like Frit Flagey, and you can’t really go too wrong with frites. Just be sure to try them! Waffles can really be found at any street corner or waffle truck, but just be sure to get a fresh warm one and order the liège type. There is a Brussels kind which is more like what you’ve likely had in the U.S., but I’m in it for the liège…and I think you will be too! The chain Vitalgaufre through the city has good ones. Truly though, I had one at a stand for 1 euro that I loved just as much! Don’t get distracted by all of the crazy toppings…make sure your first one is plain, or just with sucre. Chocolate and biscuits: Again, you can’t walk down a street in Brussels without seeing a number of chocolatiers, confiseries, & biscuiteers! It’s easy to get over-sugared in this country :) Maison Dandoy is a fancy and trendy little place with good treats, but truly any little shop has the good stuff. Pop in for samples as you walk, and take in the feast for the eyes! Chocolatier Mary is amazing, or for the ultimate taste of Belgian sweets try out Pierre Marcolini. Shopping is fun in Belgium, especially if you’re an antiques fan. There is an entire Antique Market in Place du Grand Sablon. Stroll the streets lining this square and you’ll find lots of little treasures! Rue de la Paille is one of the best streets. The Jeu de Balle Flea Market is also good for some unique items full of charm! The sprawling Midi Market is famous in Brussels and open each Sunday morning at the train station. For regular shopping, check out the Galeries Royales Saint-Hubert. Even if you’re not buying anything, the gorgeous glass ceiling and building is worth seeing. 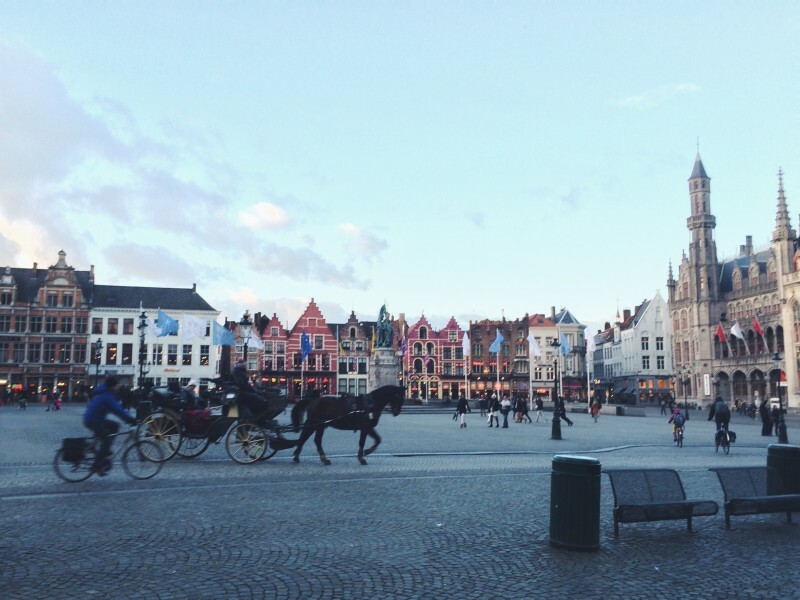 Bruges is definitely the highlight of Belgium…and for many, one of the highlights of Europe! It is a postcard town full of quaint, picturesque streets that are don’t even look real. offseason to avoid crowds. Anytime you go though, you are sure to love it! A canal cruise: Definitely hop on a boat to take you around those charming, tiny canals. It’s cheap and so worth it to do here. There is a guided tour included and the guides are usually so friendly and funny! Grote Markt: The main square must be visited, but be aware that it is a complete tourist trap in the busy months. Try to avoid eating at the restaurants or paying for the pricier carriage rides here, but definitely stroll and soak in the atmosphere. It is one of the best town squares in Europe! Climb the Belfry Tower: This climb (and the view) was one of my favorite European memories on my study abroad. It is completely worth it, but it will be your work out for the day. There are a lot of stairs and I’ve never been in a tighter space –– so avoid if you are claustrophobic! It is shockingly tight and windy at the top! See Madonna and Child: Bruges boasts the only Michelangelo sculpture which went outside of Italy during his lifetime. If you’ve seen Monuments Men you know that it’s here, and it is very worth seeing within the Church of Our Lady. Wander: Truly, the beauty of this town is that you find your own way here. Don’t take a map, just walk and walk through the alleyways and winding streets and past the tiny doors. It’s fun to walk around the edges of the city (away from the Grote Market) and see an even quieter and more local side of the town. Continue the eating extravaganza! 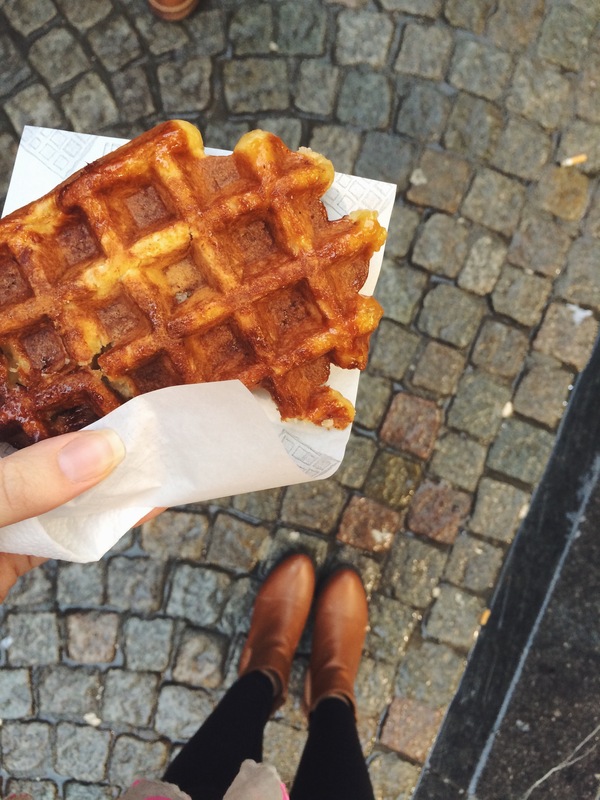 You will find more waffles, Belgian chocolates, fries, and more in Bruges. The Choco-story museum is also here and it’s a fun way to learn about (and sample) Belgian chocolate. Hotel: There are lots of great little bed & breakfast options here, but Chase found the most amazing hotel all on his own (since he had planned us a Valentines getaway here). We had no idea until after that it was the hotel from the movie In Bruges! It is called Relais Bourgondisch Cruyce for anyone celebrating a special occasion! It’s pricy, but memorable. 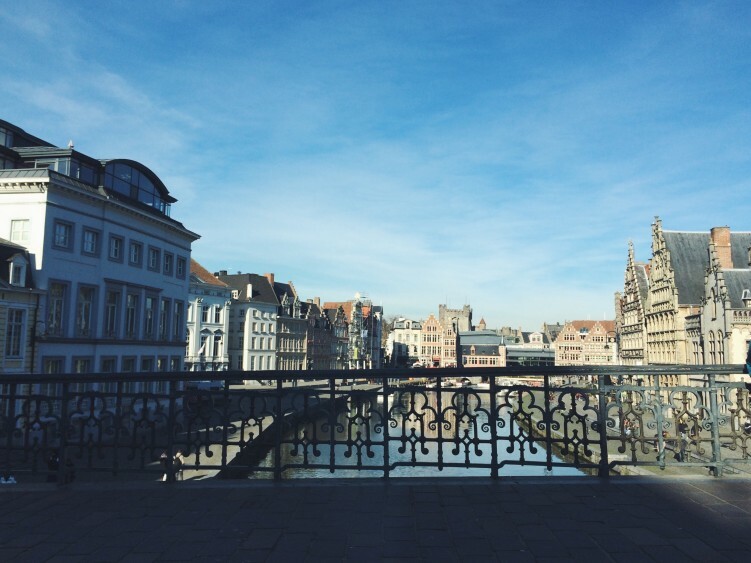 Stationed right in between Brussels and Bruges, Ghent is a fun city full of students. is within the Flanders Region, which is the Flemish region and is Dutch-speaking. Gravensteen castle: This castle can be visited quickly, and it is right within the city. Whether you tour it or not, it’s still pretty amazing to go see the grounds and old castle right next to the newer city. Belfort Tower & Cathedral: This tower is the highest in Belgium, so it’s fun to visit and climb! There is more yummy chocolate to be found here… Yuzu is one of the best. For frites, Frituur ‘T Puntzakje is one of the best. There are darling shops all through the town. Visit The Fallen Angel for vintage antique shopping, Priem which is an all-wallpaper store, and of course the nearby flower shop where they offer flower ice cream! Antwerp was a pleasant surprise, and a good mix between all of the other towns. 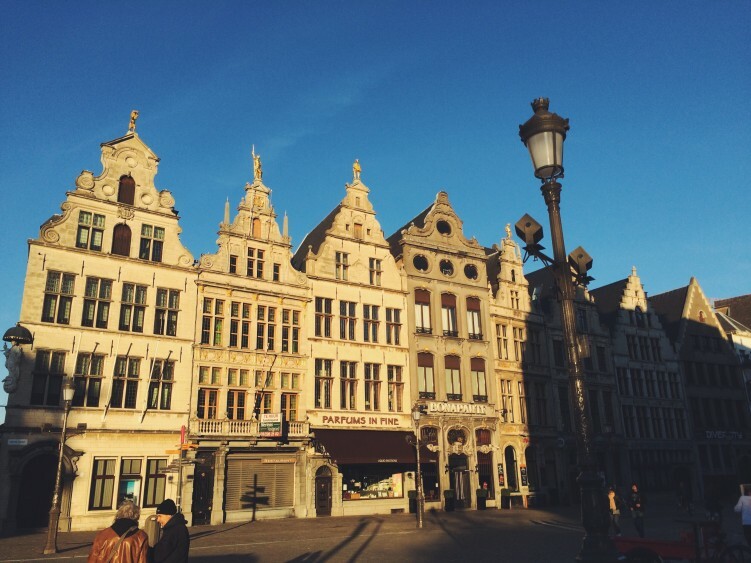 It’s smaller than Brussels, but has the charm of Bruges and the liveliness of Ghent! It is a town filled with young people while maintaining tradition. I loved it! Grote Market: This should be your very first stop when you arrive to Antwerp! Situated in old town, this is touristy but so beautiful. If you come in the winter months it’s a little bit quieter on the streets. Try to hit it before sunset when the light is hitting the buildings and lighting them up. 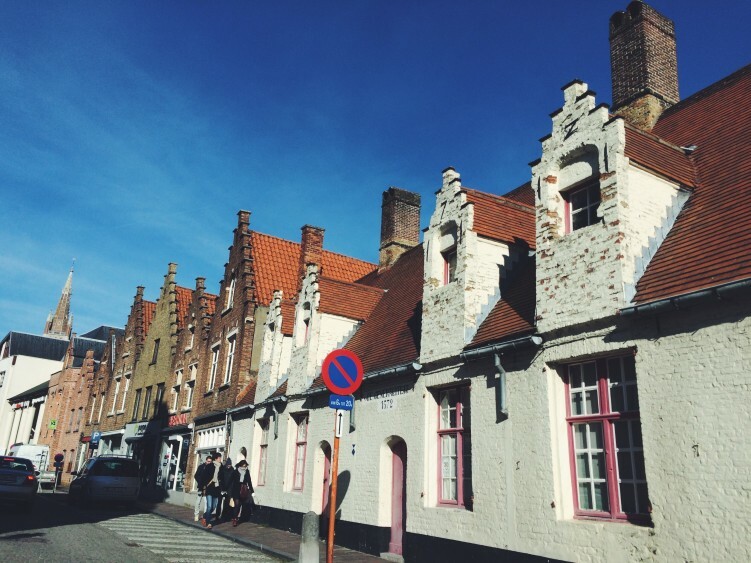 You can find lots of good boutiques and shopping lining the streets of this fashionable town, especially Meir Street for high end fashion and Kloosterstraat for antiques. Poule & Poulette was our favorite simple place to eat here! It is simple roasted chicken with all different sides, and just our style. Highly recommended! 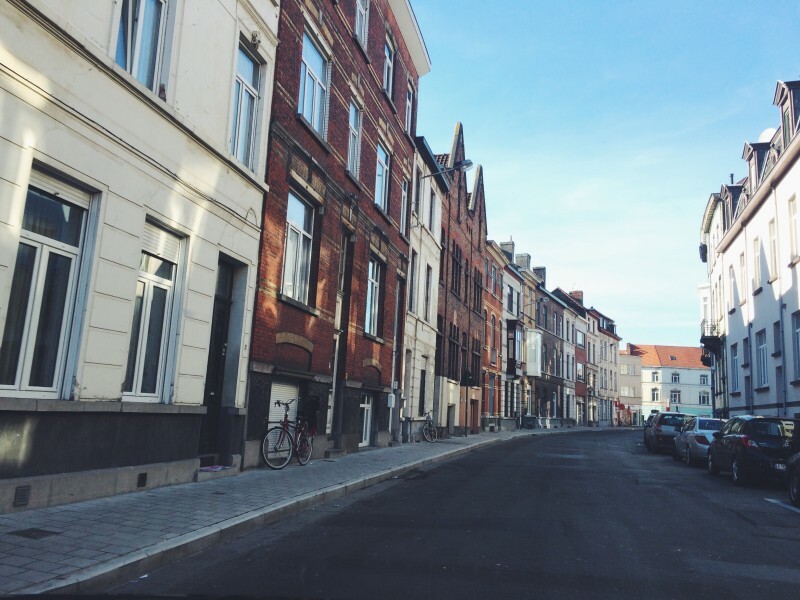 Belgium is such a treat (literally & figuratively) and is not to be missed! for anyone going to Belgium. Look at the photos of it built against a cliff! This is perfect since I am planning a summer trip to Belgium in August! I cant pronounce have of the words in this post. And I love it! Looks so dreamy. 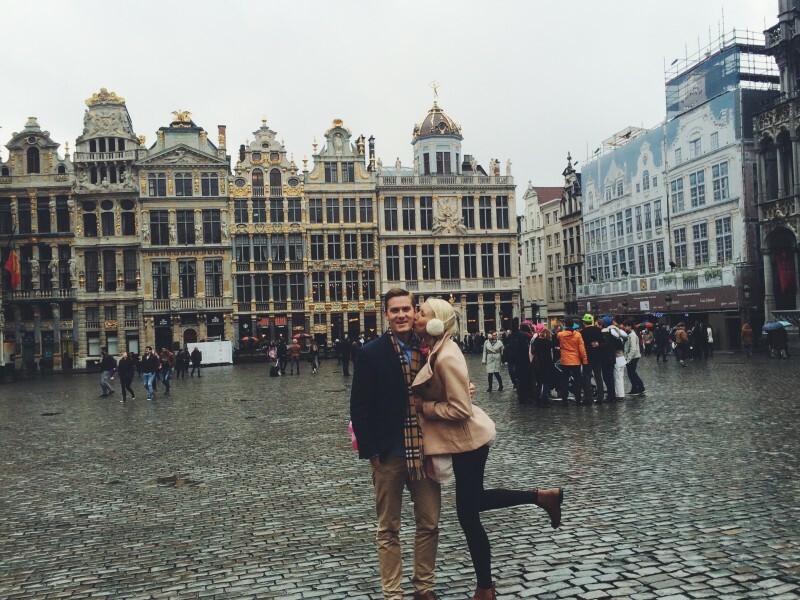 I loved Brussels! Dandoy Maison was my favorite place and we couldn’t stop laughing at the Manneken Pis statue either! Definitely saving this for when I can get back to Belgium to visit the other cities! I like the architecture. I love to visit but there are so many robbers. Avoid the suburb. I’m loving every single post. We have been to a few places in Europe and want to try different places each time. Your suggestions are sooooo appreciated. My husband and I lived in Belgium for about half a year! Unfortunately, due to the nature of his work and schedule, we were unable to travel much. This makes me want to go back so badly! We found amazing flights for 5 days to Brussels near end of March. Do you remember when you were in Belgium and the temps? Also, would you recommend traveling outside to either Germany or Paris in those 5 days? Thanks! We’ve been a few times to Belgium! We went in February once and loved it so you can’t go wrong – as long as you don’t mind if it’s a bit chillier. I love doing Europe in offseason when it’s less crowded! I always love Paris and Germany is amazing, so just depends on what you want to see- I think you could see Belgium in 3 days and combine with one of those, or just do Brussels and then all 3!